I met Virginia at a book launch party for Anne Willan. Virginia was one of Anne’s star pupils at her renowned culinary school La Varenne, and Virginia has gone on to create an illustrious career as a chef and author. What I first noticed about Virginia was she was seemingly a bit shy and she was a Southern beauty with striking blue eyes and skin like peaches and cream. Virginia’s beauty was no surprise. I’d seen her photos and you can’t hide radiance from the camera. Her shyness threw me a bit. She had been enlisted to perform a cooking demonstration at our Santa Barbara Food and Wine Weekend which was to be held just weeks after I first met Virginia at the book launch. A little voice in the back of my head asked me, “Is she going to be a good choice for a demo?” My involvement in planning the education program for the Weekend is what started that internal voice talking when all I really wanted to do was enjoy the party. I quieted the voice, assuring myself she had come highly recommended, and a few weeks later Virginia arrived to California, chef whites on and ready to teach. I made a point to arrive early and she made a point to start right on time presenting to an already-seated full house. She had me at Hi y’all. It took about 30 seconds to see what the fuss was about. She had stage presence. She knew how to cook, how to teach, and how to engage her audience. She was a professional of the finest degree. Of course I was enticed to buy her new book, Lighten up, y’all! even though I was fairly certain that I was not going to find anything in it that my non-grain eating family would eat. That first night I flipped through and found a recipe that looked enticing and I even had all the ingredients on hand. Planning to make sautéed sole that night, I pivoted to try her Red Snapper Provencal. Light, full of flavor and so quick to prepare, the provencal was a hit. I moved on to the Lemon-Basil Trout the following week, which was another home run of fresh flavor and simple preparation. 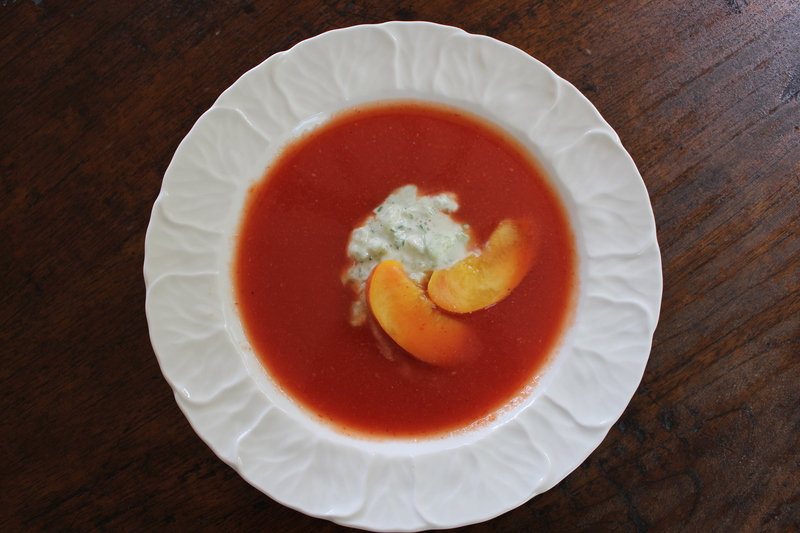 Next up was her Peach and Tomato Gazpacho. And just to show you HOW good Virginia’s recipes are, I will tell you about my experience making it. I was rushing to get some things prepared for a dinner party and realized I had to make the soup quickly because it needed time to chill before serving. I remember thinking, “I can’t believe I don’t have to peel the peaches.” I even checked the recipe and read “cored and quartered” as I proceeded with my total rookie move of throwing the unpeeled peaches, along with the “cored and quartered” tomatoes into the food processor. Round and round they went as I read the recipe again, now noting the “peeled, pitted and quartered” peaches. No more peaches, only a few tears, I decided all I could do was try to save the soup. 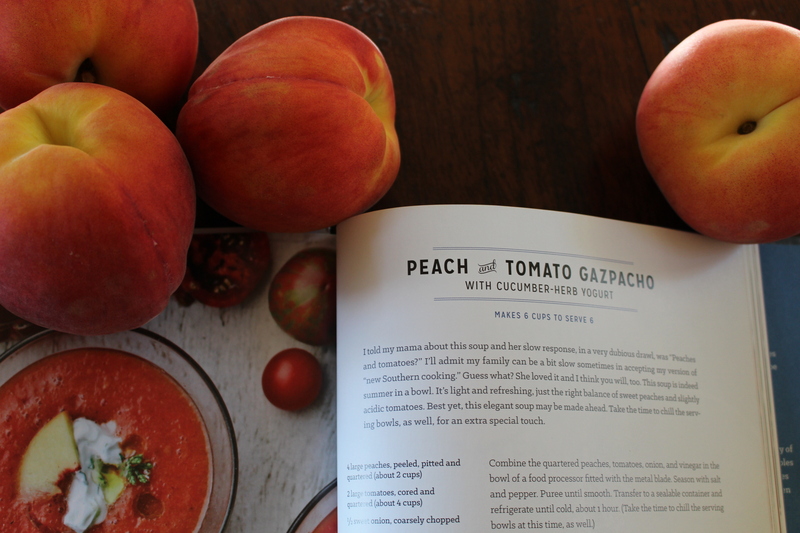 I poured it in a pan, brought it to a quick boil, threw it in the Vitamix and pureed the peel right into those peaches. I am not proud that I saved the soup. I believe that actually, it was Virginia who saved the soup. The recipe is so good, and the cucumber yogurt topping is such a perfect complement, it was still a hit even with the lack of finesse with which it was prepared. I suggest you stick with Virginia’s recipe and take the time to smell (and peel) the peaches. Puree all ingredients in food processor or vitamix until smooth. Refrigerate at least one hour until well chilled. Mix yogurt, cucumbers, chives (or marjoram) and garlic in a bowl. Season with salt and pepper. Cover and refrigerate. Check chilled soup for seasoning and add salt/pepper if needed. Serve in bowl topped with 2 T of yogurt topping and garnish with peach slices and a sprinkle of chopped chives or a sprig of marjoram. What a great post Cynthia. It’s a testament to Virginia, to which I’m not at all surprised but also to La Varenne where she trained, as writing and testing recipes so they are this good is the high standard to which La Varenne graduates are held and something Virginia often credits as one of the keys to her great success. It’s nice to see independent verification…and good looking dishes! LOVE Virginia and love this recipe! Brava Cynthia, as ever!